Dancing reaches a new-kid-sized-level in the ballroom. 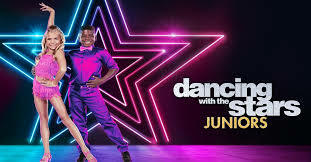 Dancing with the Stars Juniors has captured the hearts of many people. Although some people may disagree, it is definitely worth the time to check it out, as shown by the high ratings and amount of viewers that have watched it. “‘Dancing With the Stars: Juniors’(Premiere earned an)…8-10 average and (had) 5 million viewers.” Tony Maglio, author of TheWrap, states. It’s definitely worth watching because viewers will fall in love with the cast quickly and it will be hard to stop watching. It is closely related to Dancing with the Stars, but it is with children, which makes it so much cuter. This show features kid celebrities like Mackenzie Ziegler, Alana “Honey Boo Boo” Thompson, Miles Brown, and more. These kids range from National Spelling bee champs to pro skateboarders. There’s also an amazing selection of judges to critique these little celebs. The judges of this kid-sized competition consist of Mandy Moore, Adam Rippon, and Valentin Chmerkovskiy. Which are well known in their professional fields. The pros are also pretty well known around the dance world as well. Some of the pros have starred on So you Think you can Dance: the Next Generation, World of Dance, and America’s Got Talent. Just like the pros, they have a star-studded lineup of celebs on the show. The celebs include Addison Osta Smith, Alana “Honey Boo Boo” Thompson, Akash Vukoti, Arianna Greenblatt, Hudson West, Jason Maybaum, Mackenzie Ziegler, Mandla Morris, Miles Brown, Sky Brown, Sophia Pippen, and Trip Palin. These kid-sized stars paired with the fantastic pros are sure to make a super cute and entertaining show! Some people don’t like the show though because they believe that it is putting too much pressure on the kids to do well and please the people that are watching them. That and some of the kids are a little young to be doing stuff like this after seeing some adults struggle with the adult version of the show. But despite this many people, young and old, enjoy watching this show. Dancing with the Stars: Juniors is enjoyable for everyone to take the time to watch these amazing kids dance and have fun while doing it. This makes it even harder when one of them goes home. When you watch the show and they say who’s going home you see all the kids faces just sink with grief that someone is going home. But you can also tell they’re glad it’s not them at the same time. These groups of kids seem very genuine and like they are all best friends which makes it very interesting to see the process and preparation that these young stars make in order to perform well in the ballroom. Altogether these little celebrities have taken over the dance floor and our hearts and it’s definitely worth watching!